Getting something built in San Francisco takes a long time. A very long time. Whether it's a boulevard replacing a freeway, a new Bay Bridge, or a housing development, it all takes way longer than it seems it should. 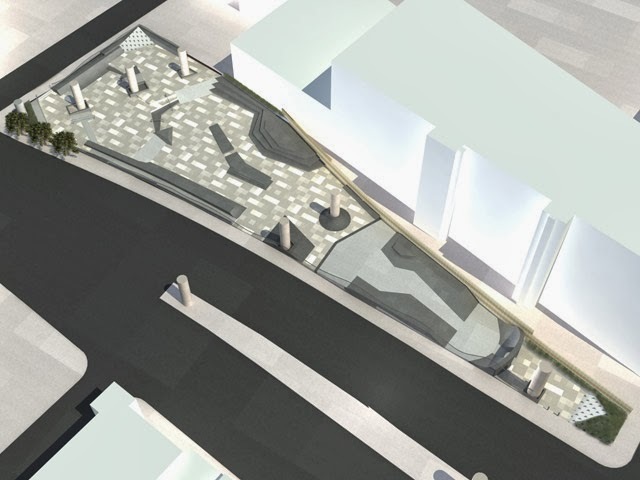 Now we're getting a skate park, yes a skate park, ten years after it was originally proposed. Getting a $10,000 grant from the Tony Hawk Foundation helped kick it into reality, even if it was only a fraction of the construction cost. The SoMa West Skate and Dog Park is finally under construction! Construction began on October 21 (four days ago). Located underneath the Central Freeway, at the corner of Mission St, Otis Street and Duboce, the skate park has been under development for at least ten years when the Central Freeway was demolished and rebuilt between Mission St and Market St. The skate park designed by New Line Skateparks will be located between Otis/Mission and Stevenson, running along Duboce, forming a triangular shape as shown in the image. The skating community come together to really push for this much needed skate parking located near the center of this great skating city. 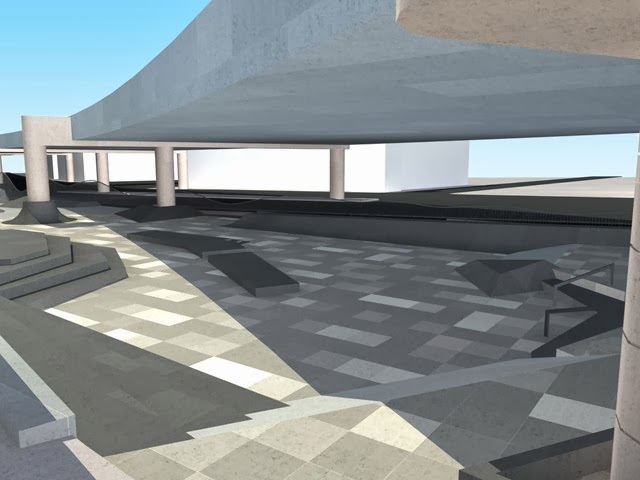 More images of the skate park and analysis after the break. For decades the spaces under the freeway has been truly blighted by parking lots, squatters and drug use. When the double decker freeway was torn down 10 years ago, there was a brief hope it would never come back up due to the new found light in the neighborhood. Once the replacement single deck freeway went up, Caltrans installed its old standard parking lots, against community wishes. The daylight between the freeway and Zeitgeist where the dog park will be located. View from Stevenson looking west towards Valencia. The current parking lot east of Stevenson where the skate park will be located. The U-Haul building and parking lot on the west side of Valencia. The dog park will lie between Valencia and Stevenson, and run as a narrow strip beside Zeitgeist. I don't have confirmation, but it appears from the DPW web site that the remaining land between Valencia and Stevenson will be retained as a ~45 space parking lot for city vehicles that previously parked where the new skate park will be built. Originally this space was planned to have basketball courts and a children's play area. The parking was kept in part to help the city pay to rent the space from Caltrans, which owns the land. Note that the final parcel under the freeway, just west of Valencia, will remain as a U-Haul parking lot. [The park] will transform a gritty paved parking lot into a more active and attractive public space to help revitalize the neighborhood. “The SoMa West Dog and Skate Park exemplifies our vision of partnering with neighborhood groups to enhance and enliven public space in San Francisco,” said San Francisco Public Works Director Mohammad Nuru. 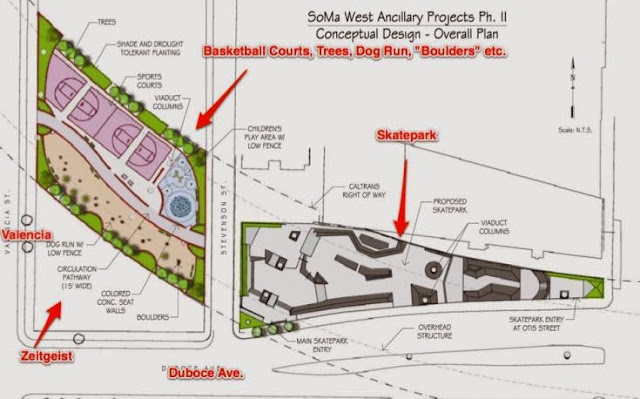 Construction on the $3.3 million SoMa West Skate and Dog Park is scheduled to be completed in May 2014. The dog park, which lies between Valencia and Stevenson, is not simply a dog run. It will have areas for large and small dogs. I'm not sure how all of this will fit in the narrow area designated for it. Specific plans are hard to come by. 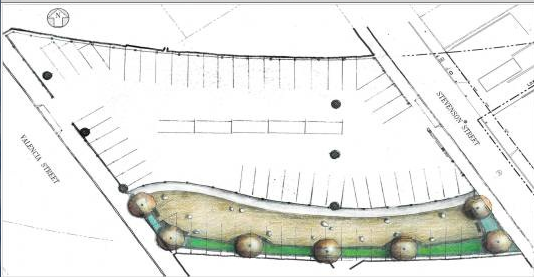 It will also have synthetic turf and lighting along the path through the park. 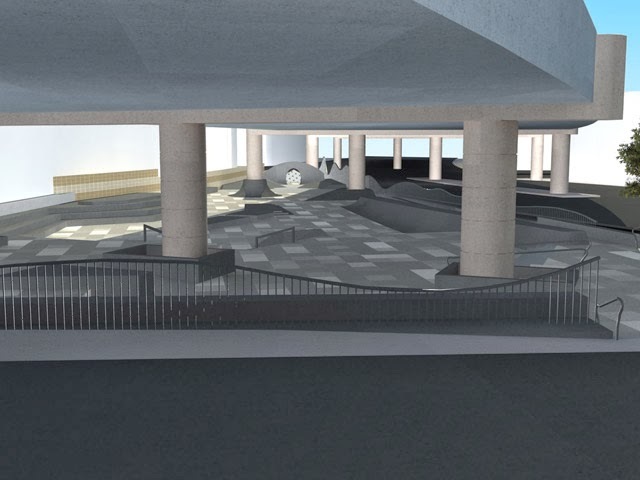 New Line Skateparks, one of the world's leading design and construction firms specializing in skateparks, designed the SoMa West skatepark. 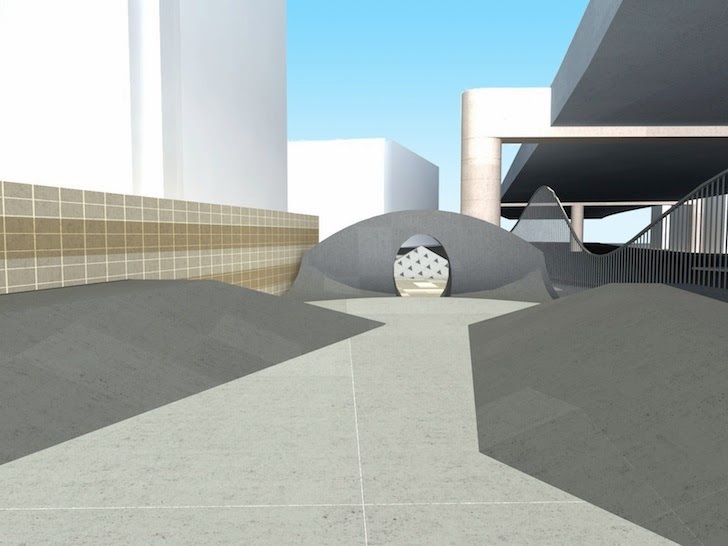 The plan reflects iconic San Francisco skate spots, with a special nod to Justin Herman Plaza. 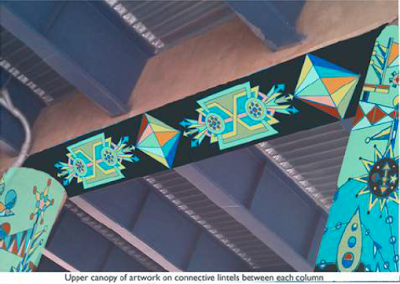 The Arts Commission commissioned San Francisco artist Jovi Schnell to paint a mural at the site. The artwork is inspired by the long-ago shuttered Woodward Gardens amusement park, which was located nearby. The skate and dog park is part of the SoMa West improvements project that is in part funded by the sale (aka proceeds) of parcels from the demolished Central Freeway north of Market. Back when Octavia Boulevard was planned, it was noted by South of Market residents that most of the improvements were going towards Hayes Valley north of Market - with Octavia Boulevard, landscaping, and especially the new park at Hayes and Octavia, Patricia's Green. 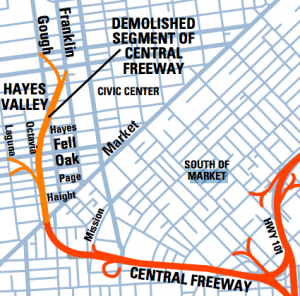 So much of the ancillary project funding has gone towards South of Market area where the freeway was rebuilt. Other improvements include improving nearby alleys with brick paving and chicanes to reduce vehicle speeds. Let's hope that the dogs and skaters and community all get along, and that the neighborhood is improved from only having a shaded parking lot. The bar is pretty low, so I see a major improvement here. Its great news that this is going ahead. Dog parks are much needed in this city! Newly being a dog owner, I completely agree that we need more dog parks! I've was still for this all along anyway though. My dog does not like skateboards one bit, so this will either be a good way to get him used to them or we'll just have to stick with our other parks. I'd like to think the basketball courts and kids park will be in a future "phase two" driven by the demand of all the families moving into the new developments and the sure to be popular dog and skate parks. And as I see it, if the the city sticks with the brick-style paving being used in SOMA and the "living ally style" North of market like the bioswales, permeable paving, and not differentiating sidewalk from street on Linen in Hayes Valley, they differences will reinforce uniqueness and neighborhood identity. And Northwest SOMA will need that neighborhood kids park.